Thank you for visiting our free classified advertisements website. Use our online free Russian classifieds placement system and post your free non-commercial ads for more 5 million Russian-speaking people in the North America (USA and Canada) today! 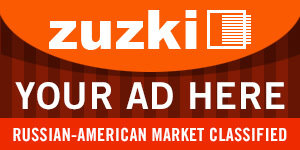 If you would like to have an Advertising campaign at Zuzki.com – place your Commercial Banner or Paid Text Ad, or place Free New Non-commercial Ad. 1 Family House for Rent in MountPocono, Wallenpaupack Lake Estate. 3 Bedroom with Air condition, garage. Lake front. Advertise in major Russian-American Newspapers, Magazines, Internet, Radio, TV. All your Advertising needs. Copyright © 2009 - . ZUZKI.COM All Rights Reserved.